Weber's Der Freischütz is fundamentally a piece about the power of the supernatural. With its score of woodwind shrieks, feral horns, murky string sonorities and trombones galore, the opera rampages around the deep, dark forest of German Romanticism, albeit with plenty of moments of peasant rejoicing for light relief. But its most famous passages are full of spooky and, above all, scenic music. So watching it performed in concert, with only the lightest of visual touches, was always likely to be an odd experience – not least in the distinctly unterrifying setting of the Royal Albert Hall, with Sir Henry Wood looking on sedately at all times. 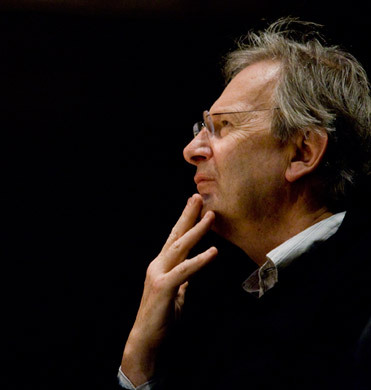 As though the performance couldn't get any further from something Weber might have recognised, Sir John Eliot Gardiner conducted the work in its 1841 French arrangement by Hector Berlioz, that great early proponent of what we now call historically-informed performance (HIP for short). As the programme book observes gleefully, this was to be the cornerstone of German Romantic opera served up 'with a gallic twist'. After a disappointingly low-octane introduction (taken too slowly even for its timeless forest setting), Gardiner's reading was all about musical risk-taking and constant, high-energy contrast. The Orchestre Révolutionnaire et Romantique manoeuvred ever-skilfully around Weber's sudden changes of texture and dynamics, with attention-grabbing solos emerging with startling clarity from what was at other times well-blended ensemble. The Monteverdi Choir, if a little too Oxbridge at times, added much to the general atmosphere. The soloists were largely excellent. Bass Gidon Saks (as Gaspard, the frustrated assistant forester gone bad) and soprano Virginie Pochon (as girl’s best friend Annette) unequivocally stole the show, such was their capacity for dramatic communication. Sophie Karthäuser's bride-to-be Agathe was suitably snow-white, her fragile soprano at its most beautiful in her long Act II lament (which brought many of the wilting prommers silently to their feet) and in the extraordinary, floated top notes of her Act III cavatina. As her ardent-but-dim lover Max, Andrew Kennedy could have drawn on more heroic vocal resources on occasion; but his light tenor was well-suited to the demands of this opéra-comique version. Of the smaller roles, the contribution of the two baritones Samuel Evans (Kilian) and Robert Davies (Ottokar) stood out. As a musical performance this had much to recommend it; but serious problems remained. Not only is this an essentially dramatic work, but much of its first act (at the very least) relies heavily on its supernatural setting for interest: without a good forest – or a credible forest-substitute – it can drag horribly. The longueurs were if anything exacerbated by small gestures towards a semi-staging: a Bullingdon Club chorus that chattered and gesticulated on demand; a couple of guns; the odd rustic waistcoat; and, most peculiar of all, a steaming cauldron that looked for all the world like a kettledrum after an encounter with an arsonist. The principal difficulty with this paraphernalia was that, like Gardiner's reading of the score, it swung dangerously between extremes; but these ones were neither equally welcome nor, one assumes, intended. The famous scene in the Wolf's Glen (or rather, the 'Gorge du Loup') is the opera's most celebrated moment, a climactic confrontation between good and evil over the forging of magic bullets. Here, though, with super-baddy Samiel screaming dementedly from the side stalls, Gaspard reappearing dressed, inexplicably, in velour loungewear, and that cauldron still steaming furiously away beneath Sir Henry's bust, the audience struggled to suppress its giggles. As any Freudian will tell you, the uncanny is uncanny precisely because it confuses the mundane and the unexpected. Unfortunately, what might in other circumstances have been spectacularly supernatural, here crossed the line all too often into the spectacularly silly – a fate from which not even a superb musical performance could save it.